An LNA and a diplomatic source in Cairo have told Libya Herald that Khalifa Hafter will be returning to Libya tomorrow (Photo: Jean Afrique). 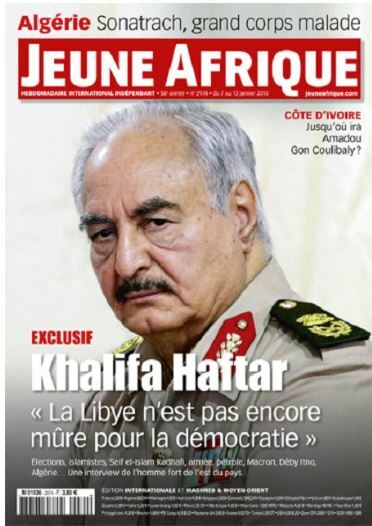 A reliable LNA source has informed Libya Herald that Khalifa Hafter will be returning to Libya tomorrow. Other media sources have quoted LNA Official Spokesperson Ahmed Mesmari confirming the news. The LNA source and a diplomatic source in Cairo also confirmed that Hafter had arrived in the Egyptian capital today. The LNA source claimed he was with him Hafter and Hafter sounded ‘‘confident and happy’’. Hafter will be greeted tomorrow in Benghazi by various domestic leaders and notables and is set to address the country in a live speech from his Rajmah HQ. The source said that Hafter had met with Mahmoud Hegazy, the former Egyptian Chief of Staff who was in charge of the Egyptian government’s Libya portfolio, and who is a friend of Hafter. It must be kept in mind that LNA sources have been heralding the imminent return of Hafter for many days. Equally, the LNA media operation has been very much behind the news curve on their handling of the whole Hafter ‘’illness’’ affair. The news of Hafter’s illness broke in Libyan media on 1o April claiming that he had fallen ill in the Jordanian capital Amman before being transferred to a military clinic in Paris as his condition deteriorated. The LNA failed to confirm any of the details of the affair. On 11 April, the official spokesperson for the LNA, Ahmed Mesmari, tweeted on the LNA’s twitter account ‘‘All the news about General commander’s health are false, Marshal Hiftar is in excellent health and he is following his daily general command duties and all op rooms specially Omar Moktar ops room’’. Later on, Mesmari avoided any direct comment on the topic at a press conference on Derna. French media has failed to produce a photo of Hafter in Paris. On the other hand, despite all the rumours and conflicting reports, Hafter has failed to make a personal appearance since 10 April.